There are several patterns that are known as Napoli dinnerware. Pfaltzgraff has used the name is several patterns including the ever-famous, hand-painted earthenware collection that features vine and floral motifs and a coordinating rooster pattern. This is perhaps the most popular dinnerware pattern known as Napoli. It is bright and cheerful; in a soft palette of colors include blue, light green, orange, yellow, and rose. 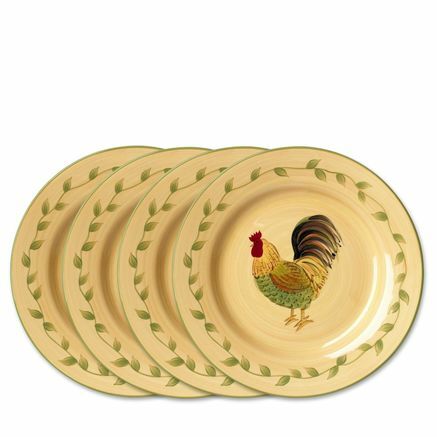 This pattern is also available in melamine dinnerware as well as square dinnerware sets. Serveware, drinkware, kitchenware, and home accents that match the dinnerware are also available. This makes the pattern a top choice for kitchen décor and tableware. This dinnerware pattern is so cute and lively. The combination of colors is pretty amazing and will definitely brighten up your home. Pfaltzgraff also had two other patterns that used Napoli in the name. One was known as Napoli Blue that was produced for a few years. It was a solid blue pattern which had some scalloped pieces. 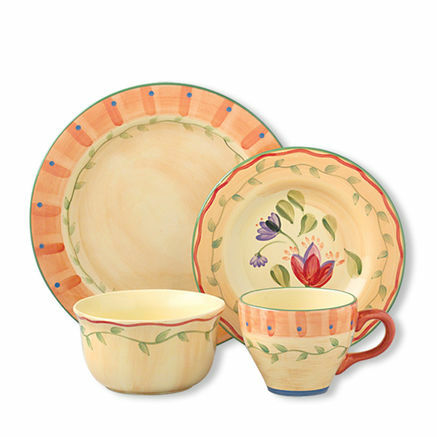 The other is known as Pfaltzgraff's Napoli porcelain dinnerware. It is totally different from the earthenware pattern. It was white porcelain with a scrolled pattern that featured various types of fruit. This was a short-lived pattern that was out for about a year. 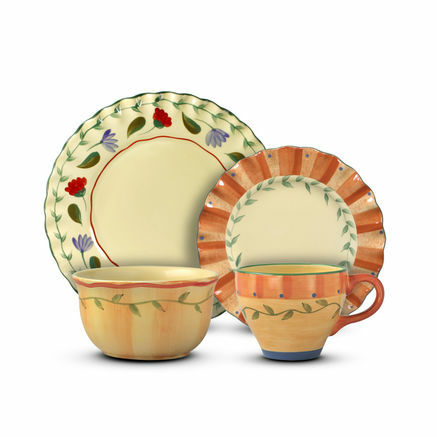 Aside from the Pfaltzgraff patterns, there are other dinnerware patterns that use Napoli in the name. Most recently is an Italian dinnerware pattern that is made available by Pottery Barn. It is a white stoneware pattern that is pretty classy. 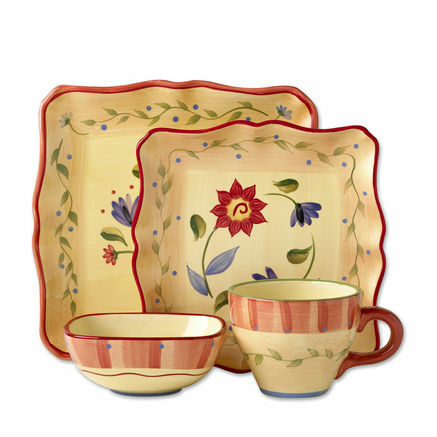 It is available in a 16 piece dinnerware set and the pieces can be purchased in open stock. Serving bowls, platters and a beautiful pitcher is also available in this pattern. Mikasa's Napoli pattern which was produced in the 80s is ivory-colored dinnerware with a floral pattern. The shape of dinnerware is unique. The colors are light shades of pink, blue, yellow, and green. In the late 90s, Victoria and Beale featured a Napoli pattern. It was a black and white pattern. Features included bright colored scrolls, fruit and flowers in shades of blue, green, yellow, and red. Tienshan also featured a Napoli pattern with blue trim. It had a floral pattern of pink, purplish blue and green. Other patterns that use Napoli in the name include International's Blue Napoli pattern, Napoli Blue by Wood and Sons, Napoli Blue by PTS, Bella Napoli by Gibson Designs, and Napoli Garden by Studio Nova. Napoli is a rather popular name when it comes to dinnerware. Often, Naples is called Napoli. It is a prevalent municipality in Italy. There is also a small town in the state of New York that goes by the name Napoli. Some of these dinnerware patterns appear to be Italian inspired, while others do not.